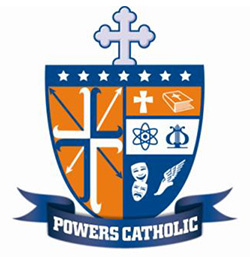 Welcome to Powers Catholic High School, a coeducational Catholic school with 650 students in 9th-12th grade. At Powers Catholic, we teach students, not subjects. This dynamic approach offers a quality experience for families who appreciate the value of a faith-based education in a safe and welcoming environment. First and foremost, we are a Catholic school, and it is our job to recognize that every student is a unique individual with a special place in God’s plan. We are partners with parents and students themselves in this journey, striving to help students reach their fullest God-given potential — academically, socially, emotionally and spiritually. With rigorous academic programs to prepare and challenge students, and a robust schedule of co-curricular and athletic activities to teach them leadership, our ultimate goal is to help young people grow in the peace and wisdom of our Lord Jesus Christ. We hope this love for Jesus and the joy of the Powers Catholic community will shine in our students through college and beyond. Powers Catholic is an outstanding school with excellent academics and high expectations for all students. What makes us different, however, is the care, concern and enduring family atmosphere you will find here. We look forward to having your family join us. 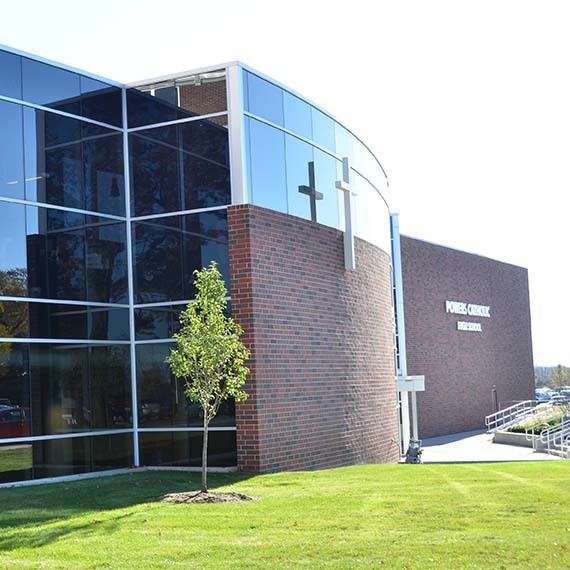 POWERS CATHOLIC HIGH SCHOOL is an integral part of the teaching ministry of the Church, serving students of varying abilities and backgrounds. Powers Catholic strives for excellence in education, nurtures self-worth in individuals, and encourages commitment to living the Gospel of Jesus Christ through service to church, family and community. Our high academic standards set us apart from the surrounding school districts in Genesee County. Along with courses in math and science, we have a renowned team-taught Honors Humanities program, and courses in fine arts, foreign language and theology. We also offer Advanced Placement and students can benefit from our Dual Enrollment Educational Partnerships with Kettering University, Mott Community College and the University of Michigan-Flint without leaving the Powers Catholic campus. 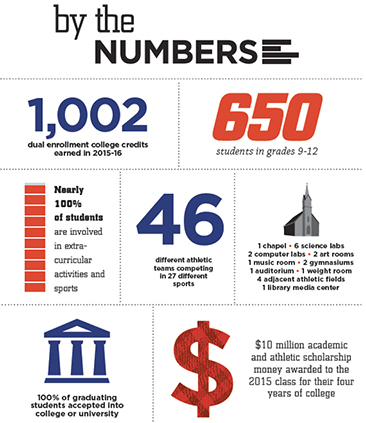 Powers students rank significantly higher than state and national averages on standardized college entrance exams. We strive to offer a wide range of elective courses including various levels of art, ceramics, concert and marching band, choir, drama, business and technology, accounting, drafting, psychology, sociology, forensics, and more. Our campus ministry team at Powers Catholic is focused on forming high school students into disciples of Jesus Christ. Alongside the entire staff, we seek to inspire young men and women to live a life centered on faith, discipleship and ministry; to help deepen their personal relationships with Jesus; and help them discover how the Spirit is leading each person to serve God and others. This happens in a variety of ways, such as daily Mass and Morning Prayer in the chapel or weekly eucharistic adoration. There also are retreats, student group activities and mission trips. Students are required to perform five hours of Christian service for each semester they are in attendance. This requirement aims to assist students in making service an integral part of their lives. Powers Catholic is committed to providing our students with exciting opportunities for academic, artistic and athletic growth. This allows students to enhance their moral perspectives, broaden their intellectual and cultural views, gain confidence, establish social contacts, develop their emotional and physical fitness, and actively learn about principles of faith, integrity, responsibility and servant leadership. Powers Catholic’s wide range of extracurricular offerings include clubs for those interested in art, books, business, chess, student government, drums, forensics, mathematics, languages, quiz bowl, robotics, and theatre, as well as opportunities to participate in organizations like National Honor Society, National Art Honor Society, Rotary Interact, Model United Nations, and Students for Life. Throughout the years, our very successful athletics program has won 29 state championships. We have a range of teams for boys and girls each season including baseball, bas-ketball, bowling, cheer, cross country, dance, football, golf, hockey, lacrosse, skiing, soccer, softball, swimming and diving, tennis, track and field, volley-ball and wrestling.etball, bowling, cheer, cross country, dance, football, golf, hockey, lacrosse, skiing, soccer, softball, swimming and diving, tennis, track and field, volleyball and wrestling.